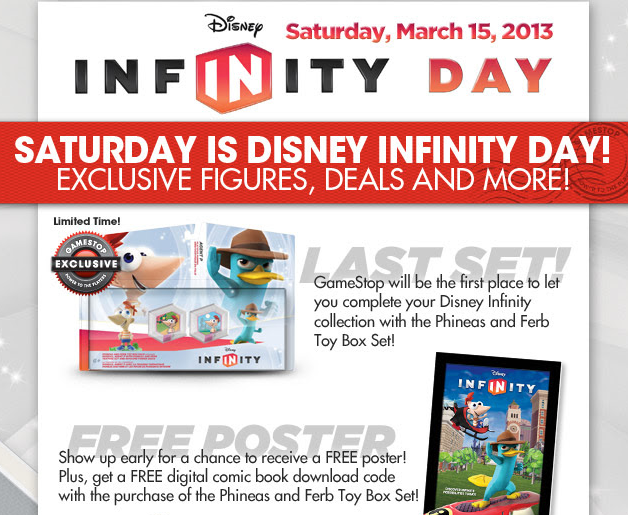 This Saturday, March 15 is Disney Infinity Day. Disney Infinity Day will offer special promotions in local GameStop locations. When it comes to gaming, GameStop is the leader in all aspects of video games. From the latest gaming systems to the hottest video games, the staff at GameStop will steer you and your family on the right path. The promotional day will offer the following specials. GameStop will be the first place to get the Phineas and Ferb Boxed Set. Free digital comic book download with the purchase of the Phineas and Ferb Boxed Set. Disney Infinity is the action adventure game featuring some of Disney and Pixar favorite characters. The video game is paired with collectible figurines that become part of the game play. Disney Infinity is available on a variety of gaming systems. Head over to GameStop on March 15 for all things Disney Infinity.